At PLASA 2008 in London, Duran Audio showcased the first available products of its new G2 familiy of sound reinforcement products, the Axys Scope and Axys Source which had been launched at the ABTT Theatre Show 2008 in June 2008. The Sound ReinforcementG2 products remain true to the Axys philosophy of 'Total Transparency' 'whilst at the same time pushing forward with new technologies and approaches. All Sound ReinforcementG2 products will have built-in amplification and digital signal processing. Having the electronics closely coupled to the drivers and a line level input stage with a very high CMRR means that your precious mix can be reproduced as accurately and cleanly as possible. The addition of DSP to the electronics offers a wealth of functionality to the user which can be easily accessed from a PC that can be connected to the units via an RS-485 network. The Axys ScopeG2 range is designed for theatre and conference applications. All of the units have built in amplification and DSP and can be networked together using RS485. Axys ScopeG2 loudspeakers come fitted with stand adaptors and/or rigging hardware. The Axys ScopeG2 range consists of four products. The T-2112 G2 is a 3 way mid/hi loudspeaker with a 12" LF driver and a coaxial HF driver. The T-2115 G2 is a 3 way mid/hi loudspeaker with a 15" LF driver and a coaxial HF driver. The UB-25 G2 is a single 15" subwoofer. The B-07 G2 is a single 18" subwoofer. 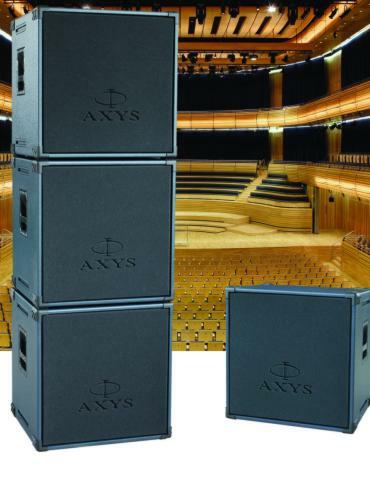 The Axys SourceG2 system is a horn loaded system that is designed for use as a front of house system for live music venues, as a medium throw reinforcement for theatre and conference applications and as stage side fills for touring applications. All of the units have built in amplification and DSP and can be networked together using RS485. The SourceG2 loudspeakers are designed to be easily ground stack for quick and easy setup but also come fitted with rigging hardware as standard. The Axys SourceG2 range comprises the B-07 G2 single 18² subwoofer and the T-07 G2 3-way mid/hi loudspeaker with a horn loaded LF section (2x10² drivers) and a coaxial HF driver. The DSP supplies eight prestes as well as user configurable signal parameters for delay, volume, 8 band parametric EQ, and cross-overs. It also offers highly advanced digital limiting algorithms and surveillance functionality.